I only saw this film on a dare. More accurately, I was told to see as part of my Assigned Viewing, courtesy of my wife, courtesy of Chatflix Podcast. The Secret Life of Pets was not on my radar at all, to be honest. 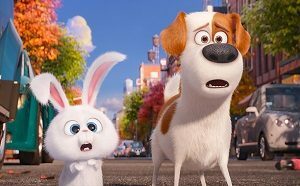 The trailer made the film look like the worst that non-Pixar animation had to offer, whilst the plot – an owner’s favourite dog needs to make room for a new, overbearing shaggy hound in their household – had the distinct whiff of Toy Story about it. The presence of Louis C.K., Albert Brooks, Ellie Kemper and Steve Coogan wasn’t enough to get me keen on the idea of sitting through 90 minutes of brightly-coloured animal antics, yet there I was, halfway through my Tuesday, sitting down to watch The Secret Life of Pets. The opening montage is probably the best this film has to offer. A wonderfully larger-than-life New York is presented to us as we watch a dozen different owners leave their pets to their own devices as they go off to work. Some sit anxiously awaiting their master’s return, others laze on the couch, whilst some turn on their favourite System of a Down song and rock out. Before you know it, Duke (Eric Stonestreet) has turned up, making Max’s (Louis C.K.) life hell, because now he has to share the attention of his owner, Katie (Ellie Kemper.) Then they’re off on an adventure (after which presumably they will become the best of buddies) traversing the New York streets, the dingy sewers and the Brooklyn Bridge, where they’ll meet all sorts of other pets. It writes itself, does it not? Actually, you’d be hard-pressed to argue that this film wasn’t written on autopilot. The situations are contrived, characters come and go, and there’s no real narrative propelling the story along. At one stage, Duke starts talking about life before Katie, but that’s quickly forgotten. Another time, the animals inadvertently hop on a ferry going the wrong way across the river. Surely they just need to wait for it to go back the other – no, no, we’ve forgotten about that. There’s a sausage factory and there’s nothing like watching dogs get excited over processed meat. So, it turns out that this is the highest grossing animated feature to not produced by Disney or Pixar, and I can’t tell if I’m bitter because it’s such an average film, or because it beat the Ghostbusters remake at the box office. At the end of the day, this is the most mediocre of films. It will keep your kids entertained, but adults will be hard-pressed to get anything out of the experience apart from an inadvertent chuckle or two. Rewatch Over the Hedge instead, or even Toy Story. Or Bolt. This entry was posted in Film Reviews and tagged Animation, Childrens, Comedy by Stuart Wilson. Bookmark the permalink.